Mastered At – Philips Records Ltd. Pressed By – Philips Records Ltd.
From the album "Gunfighter Ballads And Trail Songs". A-side published by Acuff-Rose, there is no B-side publisher mentioned on release. Similar to Marty Robbins - El Paso / Running Gun. This version does not have the "m" on the B-side label. Aww classic. 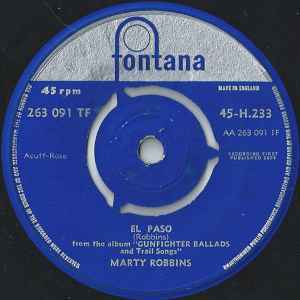 Marty Robbins is one of my all-time favourite singers. Running Gun was written by Tompall and Jim Glaser, not Tim, JIM.